Proprietary Kore™ Technology is constructed of triple reinforced and interwoven Power & Data Wires with MIlitary Ballistic Fiber, delivering superior durability exceeding 20,000 times Flex Tested. Enclosed in Carbon Fiber & Metal Alloy Housing with High Tensile Braided Nylon finish, KOBRA is entirely designed to withstand long-term wear and tear. 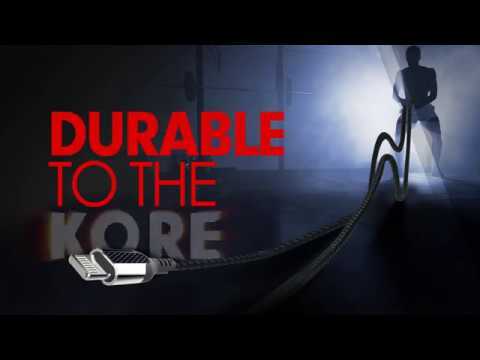 Merging Aerospace and Military Grade materials, monCarbone presents the world’s one and only Carbon Fiber Cable with DuPont™ Ballistic Kevlar® Kore™ Technology. Kore™ Technology developed with DuPont™ Kevlar® for its well known ballistic properties in military use. Lightweight at 5-times the strength of steel on equal weight basis. Kevlar® is one of the strongest and most durable materials in the world.